Natural agate with 18-kt. gold-plated edges. 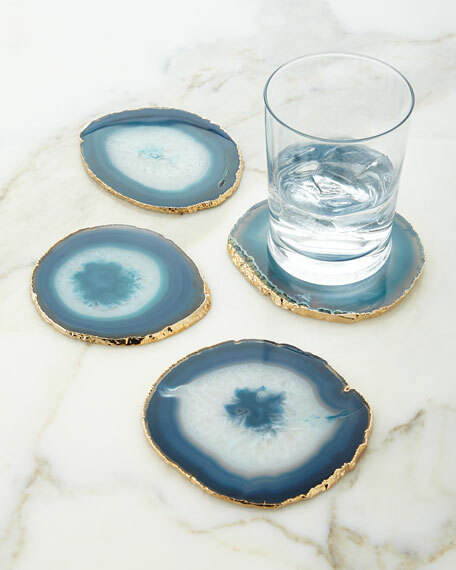 Coasters may vary slightly in color, shape, and pattern. Set of four; each approximately 4"Dia. Assorted festive Christmas-ornament shaped coasters. Made of resin with mother-of-pearl and brass inlay. Felt backing protects furniture. Each, approx. 4.5"W.
Assorted festive Christmas-ornament shaped coasters. Made of resin with mother-of-pearl and brass inlay. Felt backing protects furniture. Each, approx. 4.5"W. Set of four. Imported.